Last night I came home later than I wanted to eat. 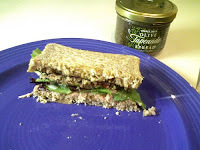 I put together this sandwich in a jiffy: canned tuna, olive tapenade and mixed greens on Ezekiel bread. I always have olive tapenade on hand. It’s one of my few pantry staples. When I open a jar of any sort, I put the date on the lid so I know when to toss it. Really helpful when you have lots of condiments (like me). Hmmm…I’m craving roasted root veggies tonight…gotta get to the store.